We're all pretty diligent about keeping our flutes clean -- swabbing them out, wiping them down... 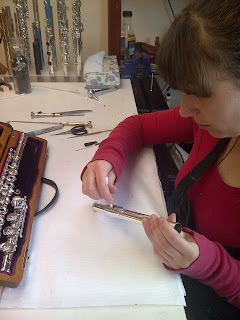 But there are some other areas of the flute that can get pretty grimey. You may not have thought about these areas, so we wanted to share! 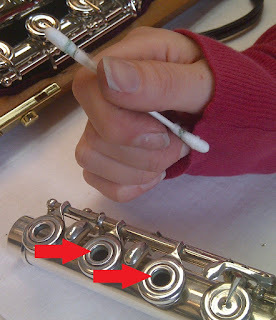 The embouchure hole and the holes in the French key cups can accumulate some "grime" just from day-to-day playing. There is a simple way to get these areas clean, though. 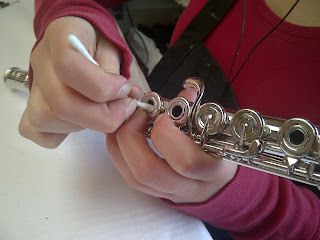 All you need is a Q-tip for the key cups and a Q-tip plus alcohol for the embouchure hole. You don't want to put alcohol on the keys or body of the flute, because it will eventually break down the "tarnish shield" coating on the flutes. Since we wipe our lip plates with alcohol to clean them, it's perfectly okay to use alcohol on the inside of the embouchure hole and the lip plate (but not on the rest of the headjoint -- just like the body). 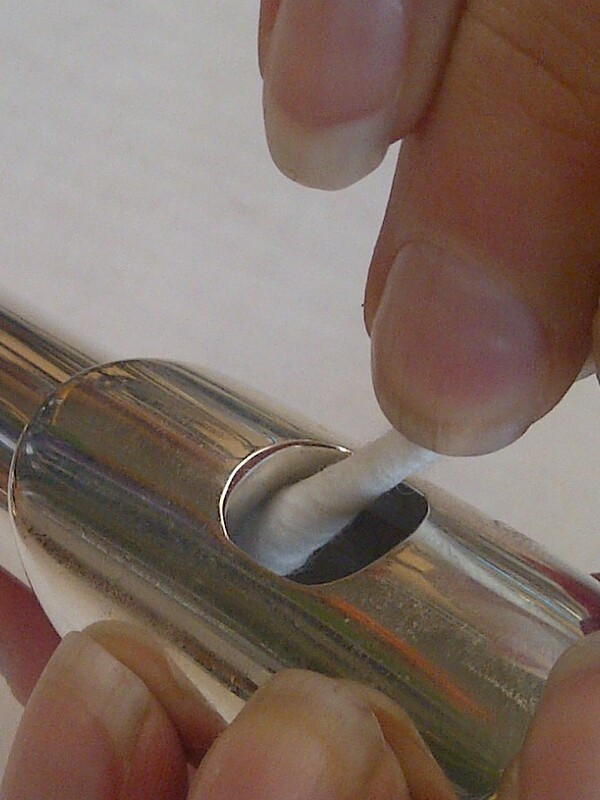 So, for the embouchure hole, you just take a Q-tip, dip it in alcohol, and wipe it around the inside of the hole. You'll want to make sure to get under the "undercutting" around the bottom of the hole as well. For the keys, you want to take a dry Q-tip and wipe it around the inside of the hole. 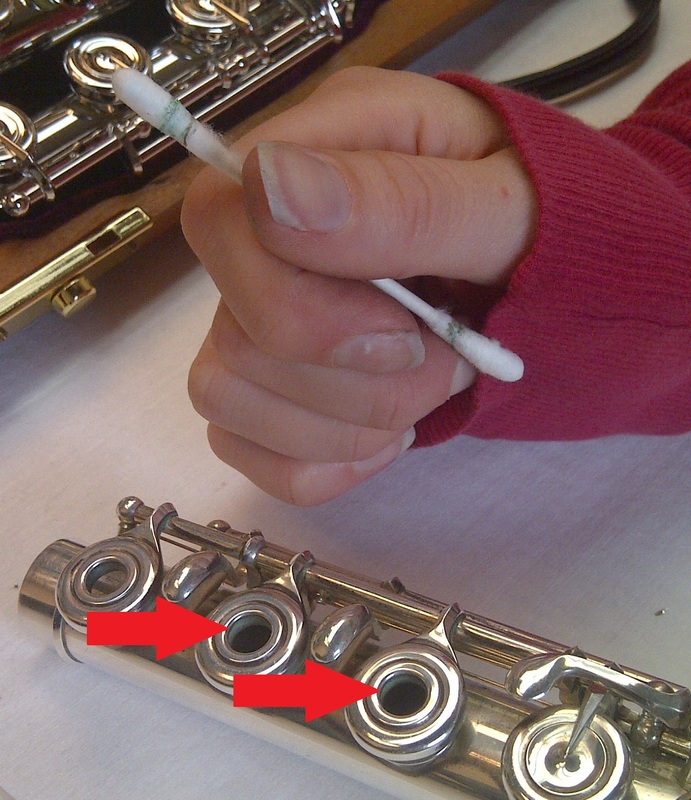 Don't worry -- a dry Q-tip is plenty effective in cleaning these areas. 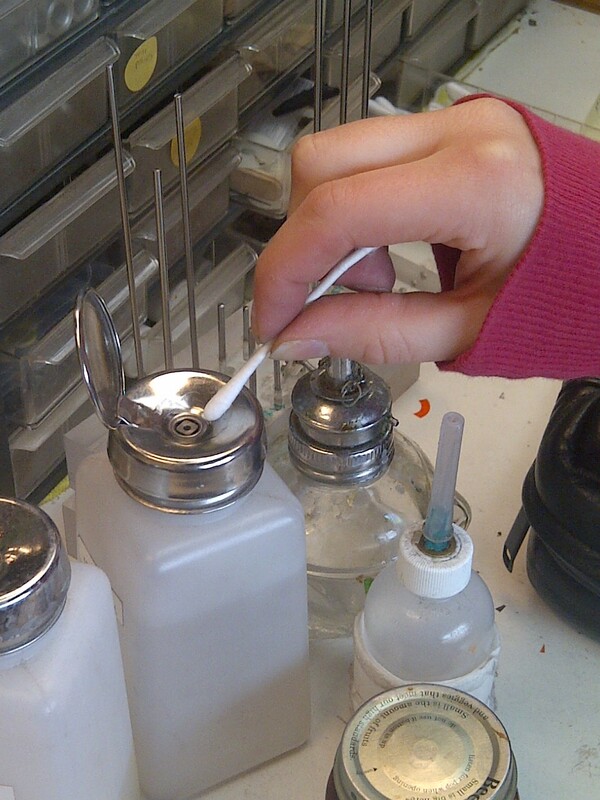 You'll also want to hold the cups down while you clean the inside. 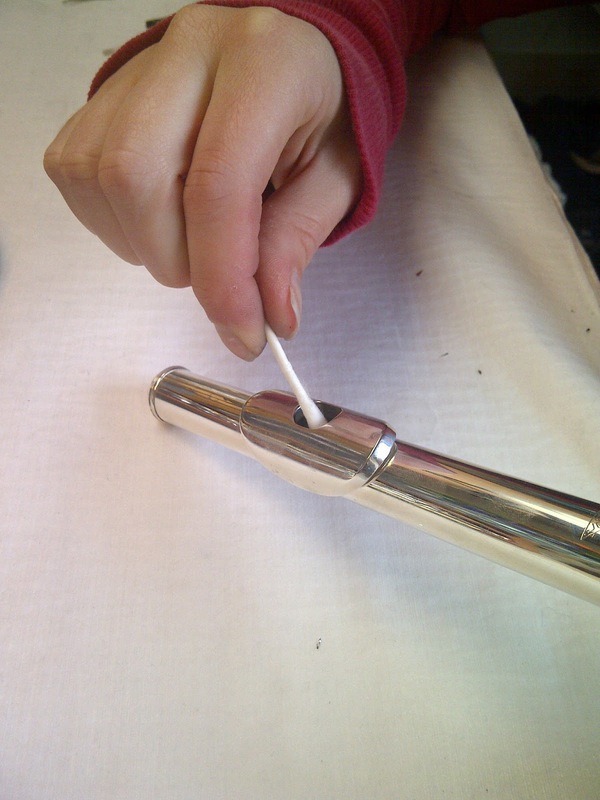 How far should the Q-tip go? 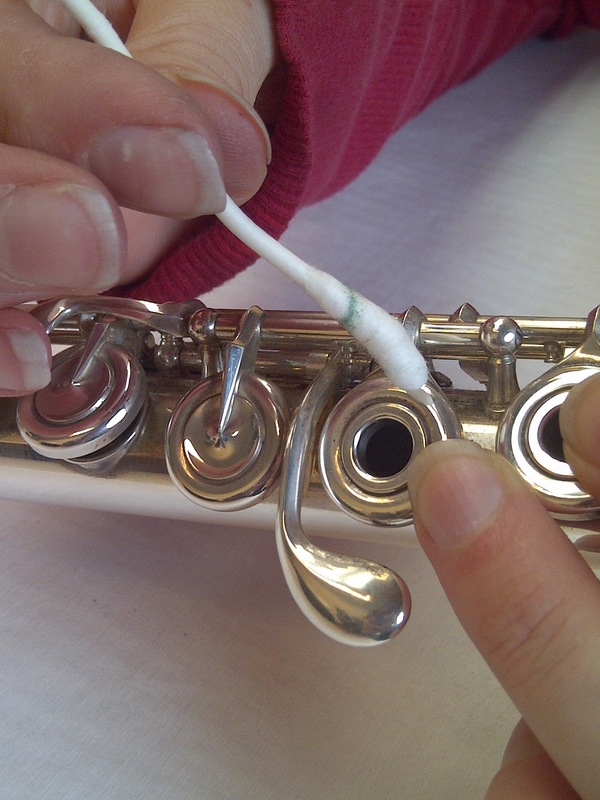 Well, in both cases (keys and embouchure hole), you'll just use a bit of the Q-tip. You don't want to push the Q-tip down to the bore in either case, because then the tip of the Q-tip will be too far down, and you won't be wiping the inside of these holes. That's all it takes, really. How often should you do this? Well, it all depends on the player. Keep an eye out -- you'll see if your embouchure hole and French key cups start to get "grimey." Some players will need to do this frequently, and others not so much. Take a look at the photos below. You'll see what to look for and how to clean these spots! Dipping the Q-tip in alcohol. 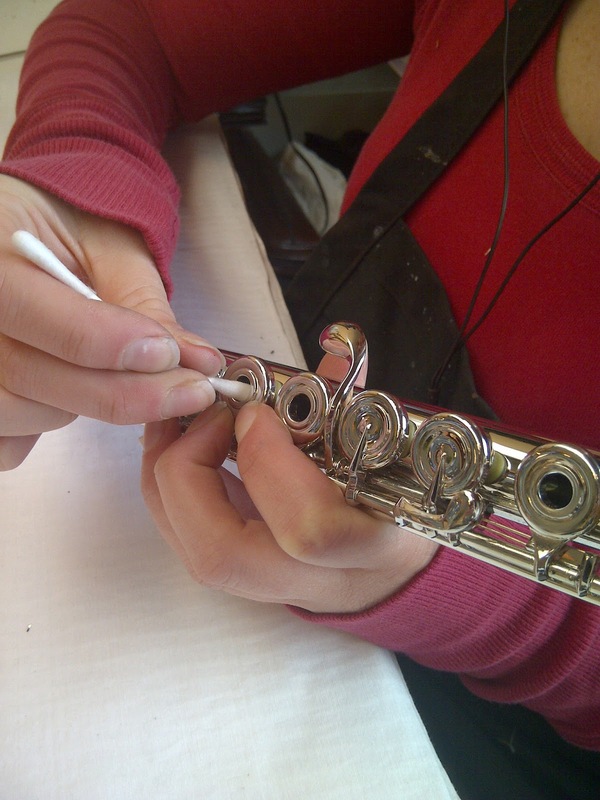 Wiping the inside of the embouchure hole. You'll want to make sure to go all the way around. Make sure to wipe the undercutting. 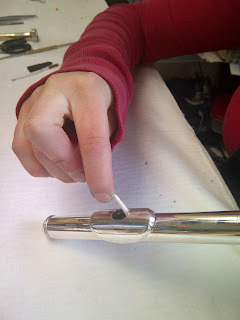 You can clean all types of headjoints. We found a 14K and circled some grimey spots. 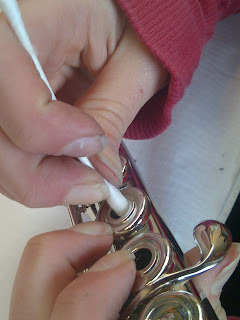 For the key cups, remember to use a dry Q-tip (no alcohol) and hold the key cups down. 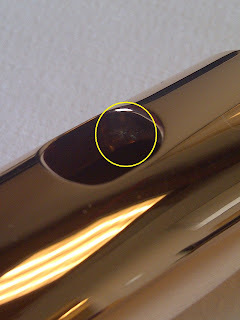 Green ring on the Q-tip is what came from cleaning the hole! Arrows point to green "grime" inside the holes. This is how you can tell these key cups need to be cleaned inside!